"Think out of the box" of the blues scale with former UK guitarist of the year Ron Sayer! This course will give you great ideas on how to use new sounds and notes to make your playing more hip and edgy. 12 lessons from the master! Voted "Guitarist of the Year" by Guitarist Magazine, Ron Sayer has worked with Buddy Guy, John Mayall, Matt Schofield just to name a few. In the first part of his course, Ron will teach you ways to improvise on the blues form that go beyond using the blues scale. First, you'll review some fundamental concepts and then get prepared for playing more outside notes. Includes tons of Ron's favorite tips & tricks, great licks and riffs, with downloadable tabs. So get practicing! Start by signing-up & watching a few free videos below ...and don't hesitate to get in touch directly with Ron if you want feedback on your playing, just use the tutoring link on the right. Mixing Major & Minor Pentatonics. He is awesome player and I am sure he can offer exactly what I am looking for. I would buy another course. As far as the quality and format- superb! Ron Sayer is the consummate ‘Guitarist’s guitarist’. 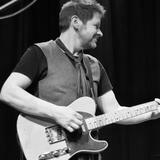 Influential in the careers of Oil Brown, Sol Philcox Mark Howes of Dove and many more, Ron has cemented himself on the UK Blues circuit. In terms of achievements, Ron has been nominated for four awards in the British Blues Award; namely for the album ‘Better Side’, single ‘Don’t Make Me Stay’ and co-writing Oil Brown’s third album ‘Here I Am’ which landed two of the four awards. He has also won the coveted Guitarist of The Year award, so you can be sure of mastering your guitar with none other than Ron Sayer Jr.